The Behavior Editor is a design tool for creating and managing a Behavior Graph, by combining multiple Behaviors and Operators inside a Behavior Container. 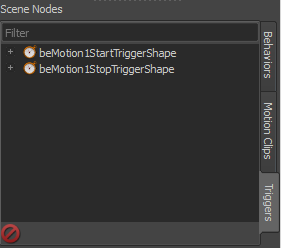 The Behavior Editor also contains the Trigger Editor, a dedicated tool for creating and managing a Trigger Graph. Please refer to the Trigger Editor page for more informations. 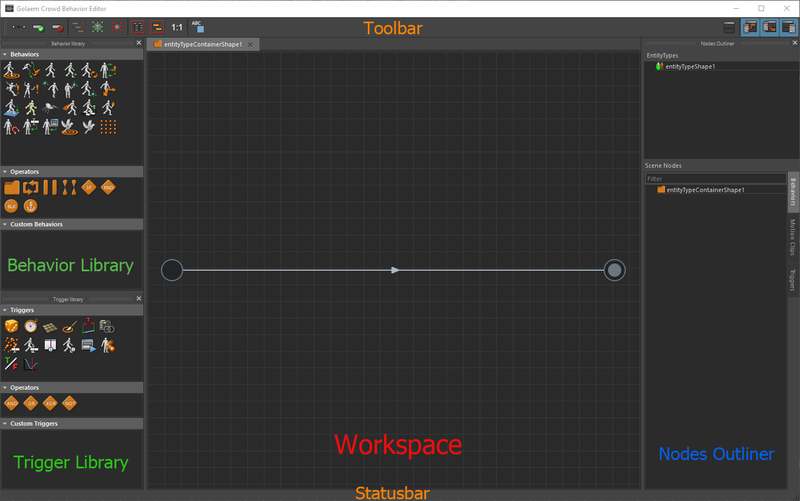 The Behavior Editor is composed of a main workspace to design a Behavior Graph, the Behavior Library, the Trigger Editor and its Trigger Library, the Nodes Outliner, a toolbar and a status bar. The workspace is a node-based graphical interface where you can combine Operators and Behaviors to create a Behavior Graph. For controls see Behavior Editor Controls. Several workspace tabs can be opened, each one showing the content of a Behavior Container. Without any Behavior Container opened the workspace stays empty, prompting the user to create/open an Entity Types. Opened Behavior Containers tabs are saved with the scene. After running the simulation, Behavior Graph Feedbacks are shown in the workspace. The Behavior Library is the toolbox of the Behavior Editor. It contains three views. It provides a quick access to built-in behaviors. Behaviors can be added to the workspace by drag-and-drop. This view provides an access to Operators. As the Behavior View, operators can be added to the workspace by drag-and-drop. The Custom Behaviors view is a file browser, pointing on a chosen directory containing Custom Behaviors, i.e Behavior previously saved. Drag-and-drop a Custom Behavior into the workspace to load it. For Custom Behavior Containers, Double-click to open it in a new tab, drag-and-drop to add it inside an edited Behavior Container. Notice that the browsed directory can be changed in the Crowd Settings Dialog. 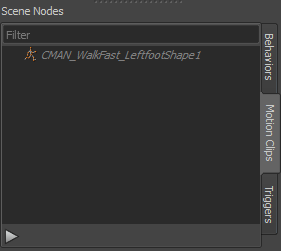 The Nodes Outliner is a snapshot of the Entity Types, Behaviors, Operators, Motion Clips and Triggers currently available in the scene. It contains two views. 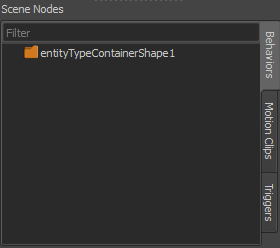 It contains the Entity Types and Group Entity Types currently available in the scene and mapped to a Behavior Container. Double-click on the desired Entity Type to open the mapped Behavior Container in a new tab. Mapped Dynamic Attributes are visible under Entity Types in the view. To add a New Dynamic Attribute, right-click on an Entity Type to open its context menu then select Add New Dynamic Attribute. This view is divided in three tabs. Each tab contains a filter box to perform accurate searches on relative nodes. This tab contains all Behaviors and Operators of the Maya scene. Drag-and-drop one or several Behaviors or Operators to add them inside an edited Behavior Container. Double-click on a Behavior Container to open it in a new tab. This tab regroup every Motion Clips present in the Maya scene. Drag-and-drop one or several Motion Clips on a Motion/Locomotion Behavior to add them in the simulation. Double-click on a Motion Clip to select a new animation file. Ctrl + Double-click on a Motion Clip to preview it in the Motion Clip Preview tool..
Click on to preview the selected Motion Clip in the Motion Clip Preview tool. This tab contains every Triggers present in the Maya scene. Drag-and-drop a Trigger on a start/stop Behavior Trigger to use it in the simulation. The Triggers Tab filter box allow to search inside the Triggers attributes. It contains quick access buttons mostly used for changing the display or editing in the main workspace. Back to parent button, to get back to the parent of the current Behavior Container. It's also possible to use CTRL+double-click. Expand selected Behavior Containers. If no selection, expand workspace's collapsed Behavior Containers. Collapse selected Behavior Containers. If no selection, collapse workspace's expanded Behavior Containers. Sticky Notes button, to add Sticky Notes inside the workspace. It contains a contextual report relative to the current selection. Behavior Graph Feedbacks are also shown in the Task bar.